Everybody I’ve played this record to has been knocked out by its power and blue tinged desperation. But in spite of a great deal of effort no info on Rose herself or the recording has come to light – other than it’s St Louis origins. Recently however I found myself listening to the Jimmy Taylor on Pompeii and from that I think it’s safe to date this 45 to 1968 so similar is that recording to this one. I don’t know of any other cuts by Rose – but I've Been Hurt has enough going for it to outweigh 10 singles by another artist. St Louis maestro Oliver Sain does his usual bang-up job on the arrangment and the production. The lead guitarist (Phil Westmorland?) is quite brilliant and I love the meandering tenor sax (presumably Sain) as well. 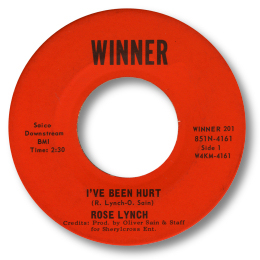 But the best part of the record is Rose herself – utterly convincing as the woman wronged. The only other 45 on the label is a pretty good horn rich funky blues by another singer unknown to me – J R Johnson.